Introduced to many states through pet release and escape. Status in Nebraska: The only recorded non-indigenous reptile in the state of Nebraska. They have been seen in the Little Blue River in Adams County and in Burchard Lake in Pawnee County. The Cumberland Slider has only been introduced to a small part of the state and it is to early to tell whether or not it will become an established invasive species in Nebraska. Native range includes two rivers, the Cumberland and the Tennessee Rivers. The Cumberland Slider is a North American species. It has a narrow yellow or orange-yellow stripe behind each eye. 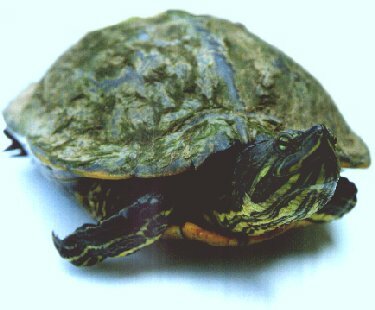 There is a pattern of small blotches or rings on its plastron. This species prefers quiet waters with muddy bottoms. Areas with a profusion of aquatic vegetation, organic substrate, and overhanging basking spots are especially favored. The Cumberland Slider is omnivorous as an adult, but primarily carnivorous as a juvenile. The adult eats algae, seeds, plants, aquatic vegetation, tadpoles, small fish, insects, crayfish, worms, and mollusks. Little is known of its impact on the Nebraska ecosystems. The only way to control these turtles, short of poisoning whole lakes, is through hunting, trapping, and collecting eggs and hatchlings.